Christian Budu’s artist diploma recital at Jordan Hall Tuesday night proved once more that New England Conservatory recognizes and develops consummate artistry. 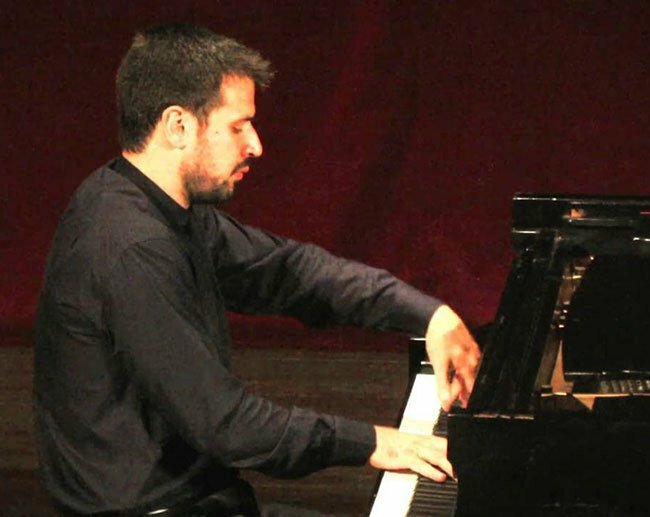 In 2013, the young Brazilian of Romanian birth won the Clara Haskil International Piano Competition, on its 50th anniversary. The judges there value “musicality, sensitivity, humility, constant questioning, perpetual seeking for excellence, listening to partners and respect for the composer,” and sometimes declare no winner. Earlier laureates have included Richard Goode, Mitsuko Uchida, Christoph Eschenbach, Till Fellner, and Evgeny Korolyov. We can see how he belongs in the pantheon. Since then Budu apparently has been in good hands with Wha Kyung Byun at NEC; one also detects whiffs of her husband Russell Sherman’s philosophical polishing. Budu constructed a literally fantastic recital. The C.P.E. Bach Fantasia for Keyboard in C Major marries operatic flair with the wit of a popinjay. Its many weird stop-start contrasts and terraced dynamics seem almost unaccountable. To this almost schizophrenic work Budu brought a free and moonstruck realization entirely apposite on a modern piano. His tone ever sang and his arsenal of gestures always signified. He even arpeggiated harpsichordishly by using variations in velocity to suggest dynamics. From the outset he nailed the theses of an original interpreter. BMInt‘s resident expert David Schulenberg explains that C. P. E. Bach’s Keyboard Fantasia in C, W. 59/6 (also known as H. 284), composed at Hamburg in 1784, appeared in print the following year, in the fifth volume of the composer’s famous series of publications “für Kenner und Liebhaber” (for amateurs and connoisseurs). Intended primarily for clavichord but doubtless also played at the time on fortepiano and harpsichord, it is one of a handful of pieces in which the composer, famous for his improvisations, left for posterity an impression of “what a Fantast” he had been, as he mentioned in a letter of the period. Although in principle in a three-part (ABA) form, the piece cloaks its underlying design by jumping unpredictably between expressive arpeggiations, passages resembling recitative, and sudden bursts of rapid-fire figuration. Throughout, one also hears the chromatic harmony and remote modulations that Emanuel Bach learned from his father, applied here within a proto-Romantic style of his own. Why the Moonlight Sonata again? we then asked ourselves, before realizing that it constituted a fulcrum for the programmatic conceit of moonstruck fantasy that lensed the entire recital. Budu took the familiar funereal three notes at the beginning almost without expression, putting us entirely off guard. Within a couple of minutes, though, he had begun to coax an amazing sustain from the melodic figure as the accompaniment waxed more and more phantastsich. He seemed loath to coarsen his Apollonian distancing by expanding beyond mf. His mastery of micro-rubato in the p-pppp dynamic range set him apart from any pianist of his generation. Did he get his license to steal time from Sherman? If so, he earned it without either willfulness or coyness. I would never have imagined legato accents, but somehow Budu achieved that oxymoronic effect without breaking his relaxed phrases in the Allegretto. In the very fast Presto a gloss of elegance perhaps understated the excitement, almost as if the artist were commenting on Beethoven rather than playing him. By the time Chopin’s Polonaise-Fantaisie began to unreel, Budu’s dreamlike sleight of hand and relaxed tempi began to blur barlines. Not since hearing Cherkassky on his own instrument had we heard a Jordan Hall Steinway sound so lyrical and pearlescent. If the playing was a little vaporous, the beauty of tone overcame most reservations. Yet moments came, such as the trills in octaves, when more immediacy and less distance seemed wanted. And Budu should develop a more varied palette of forte playing to extend his vocabulary of soft colors. Budu’s performance essentially left nothing wanting, though he added, “yet, there is room for one good cavil. At ‘the forte assai’ [242-268], that final “grand theme,” Chopin at his most triumphant, grandly gloriously exultant, that neighboring listener would have wished that the pianist had broadened a bit more, had indulged himself and his audience in that ecstatic apotheosis. For some pianists and listeners, Schumann’s Fantasie in C Major constitutes a noble, large-arch homage to Beethoven, death and loss. Yet to this listener, Budu approached the shorter spans merely as elegant but mercurial pianism, and not always exactly as written, especially in the middle movement. Over longer stretches, the pianist better decoded the longings of Schumann’s lofty Eusebius. One felt privileged to have witnessed these idiosyncratic and pianistic reveries even if they were perhaps more redolent of Oberon and Titania than Schumann’s muses or humors. Budu should not forget that he can ravish with delicacy only up to a point before firmness and directness are desired. Who could that Mysterious Stranger, your “Jordan Hall neighbor,” possibly be? Maybe the same mysterious stranger who commanded Mozart’s Requiem. Or not. Gotta love reviews that quote a critics seat mate. It sounds like it was Donald Francis Tovey…but that is not possible. Sir Donald died in 1940. Hint: It’s someone who has written a few BMInt reviews. $50 prize to the first person successfully to guess.